The Olympic Symphonium is a unique collaboration between three accomplished Maritime musicians. With the hopes of forming a quiet escape from their accustomed high-energy rock/pop projects, the idea of this group was to focus more on the subtle, gentler side of music. 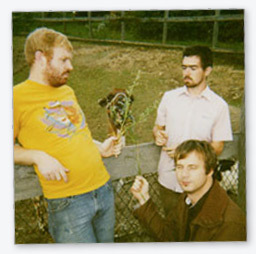 The group released their stunning debut, Chapter 1, in early 2007. The album has been distributed, reviewed and sold all over the world and is now out of print. Over the past year, the band recorded their follow-up in a clothing store, a house, a shed and a field. The result is More In Sorrow Than In Anger, a collection of 10 intimate and interesting songs that require multiple listens. Their eclectic mix of guest musicians featuring Catherine MacLellan, Dale Murray (Cuff The Duke), Jenn Grant, Joel Leblanc (Hot Toddy) and Rose Cousins help highlight the group's unique and personal sound. The three members, Nick Cobham, Kyle Cunjak and Graeme Walker, all share singing and songwriting duties while rotating around various instruments. The album opens with a piano/classical guitar duet and moves through beautiful, melodic pop to soft, slow yearnings and dramatic sting-laden stories of personal contemplation. Lately the Olympic Symphonic have secured funding from the province of New Brunswick and FACTOR, earned consistent airplay on national CBC and campus radio and were lucky enough to have shared the stage with artists such as Hayden, Jason Collett, Al Tuck, Bruce Guthro, Joel Plaskett and Snailhouse.